Veja dois dos lugares considerados Patrimônio da Humanidade mais visitados da Polônia em um único dia neste combo de excursões partindo de Cracóvia. Preste homenagem às vidas perdidas durante as atrocidades da Segunda Guerra Mundial no Memorial e Museu Auschwitz-Birkenau, onde você pode visitar o antigo campo de concentração nazista e ver as exposições relacionadas à sua história à de mais de m milhão de vítimas. Em seguida, desça até uma fascinante cidade subterrânea talentosamente esculpida em sal e rocha na Mina de Sal Wieliczka. Salt mine tour was excellent. Auschwitz-Birkenau started late and was too crowded. Both guides were did a great job. We were picked up outside our hotel by a small AC minivan. This is NOT a personal tour though. 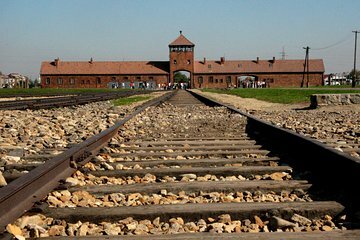 You will be thrown into a larger group at Auschwitz with one of their tour guides. It’s a very long day till 5 or 7 pm I can’t remember, but be sure to bring a light jacket for the salt mine! My Auschwitz/Salt Mine tour was generally enjoyable. Our driver, Lucas, was great and very accommodating. The Salt Mine was an incredible experience that I would recommend to all. Auschwitz was a truly heartbreaking and humbling experience, but again an experience that I would recommend everyone to take part in once in their life. The only complaints that I have are about my tour guides and the time management. While the Salt Mine tour guide wasn’t as bad as my Auschwitz tour guide, she was very hard to understand. Being a Polish native, her English was very good, but she spoke so softly, quickly, and mumbled so much that I literally was not able to retain any of the information that was relayed to me. Luckily there were a lot of things to look at and read so I didn’t have to rely solely on her. The Auschwitz guide was a different story. Obviously being a Polish native he was going to have a Polish accent, which I completely understand, but the accent was so thick and he, too, spoke so rapidly and mumbled SO much that I could not understand anything there either. The headsets at Auschwitz were also a hassle, I had the volume up all the way and still had to press the headphones into my ears to hear anything. I’m pretty disappointed in the guides, but it didn’t keep me from enjoying the experiences. I wish I remembered the guides’ names. Time management was also irritating. Our salt mine tour ended around noon, but our concentration camp tour didn’t start until 4, which left us a ton of time to kill. Fortunately, people on my tour wanted to stop for lunch, so we did, but the original plan was just to go sit at a auschwitz until it was time for our tour. We didn’t get back until Kraków until 10PM, which could have been 7 or 8 if the tour was organized more efficiently. Would definitely go back to both places, just probably not through this tour. Very interesting tours, both of them led by friendly and knowledgable guides! Also, our driver, Tomasz, drove us safely and was very helpful! As for the sights, they are not to be missed both are unique! Auschwitz - Birkenau was very moving. It is certainly a place everyone should see. The Wieliczka Salt Mine is amazing. I couldn't figure out what was so great about a salt mine until I went through it. The carvings and sculptures are amazing. The mine was in continuous operation for many centuries. The tour was good and well organised. The salt mine visit was really interesting and enjoyable, although we did have difficulty in hearing everything that the guide said in the salt mine and some of the microphones were not working well. Its not very clear on the site but whilst you have to go down 400 or so steps you can come up by lift although be prepared for feeling a little claustrophobic in the lift as you come up as its tight and only takes a few people at a time. The guide was good generally but did not really explain fully how we would get out of the salt mine and how long it would take. The salt mine tour ended at the shops and we rather assumed that it would be a quick exist, but in fact the lifts only take a few people at a time and we had to join another group of tourists simply to exit and there was a queue which took a little while. We thoroughly enjoyed the visit, though, and the chandeliers and statues made entirely of salt really are a sight to see. The followed the trip to Auschwitz, lunch was outside the museum which was fairly pleasant and catered for vegetarians and gluten free which is often difficult. I think it states somewhere that there would be little to eat there but there are restaurants. Auschwitz is harrowing and difficult to see and fathom but is history and a monument to what should never happen again. The guide was good, extremely somber and clearly knew the history...not for the faint-hearted. The scenes are grim and are unlikely to go from there without feeling shock, horror and certainly tearful. Experienced a dust storm outside and it was dry and hot when we went so perhaps protection from the heat a good idea and carry a bottle of water. 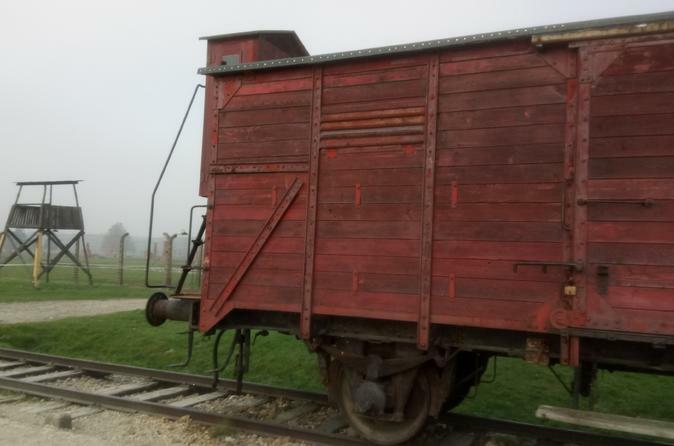 Then followed Birkenau which was an hour walk., the largest concentration camp. I sat out for that one, as as my back was giving way but the tour driver, Michael was really attentive and suggested that he would take me for a ride round the camp and show me a few of the sites whilst the others did the walk. Their experience of tour to Birkenau was that it was far dire then Auschwitz and harrowing but historically clearly depicted what it should. Overall I was really impressed by the tour and it was worth booking it. Michael was excellent and really took care ... and entertained us with Queen, a clear fan... would definitely recommend this tour and of course Michael.